As usual, there are color pictures of stitches in the back of the book. Simply look at the stitches, choose the one you want and get to stitching! 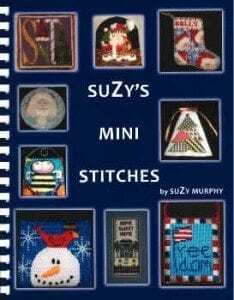 This is the newest book from Suzy published in late 2008. Although some of these stitches are not really “mini” they ARE different from her stitches in Suzy’s Small Stitches. There’s also an index that you can refer to of “effects” so you can search for things like appropriate stitches for trees or clothes, etc. The Crazy Plait, the Elongated Long Arm Cross and Heart 1 all look like fun stitches to me. 153 pages, spiral bound, color stitches in back pages only, color front cover, lots of extra tips and hints as usual.